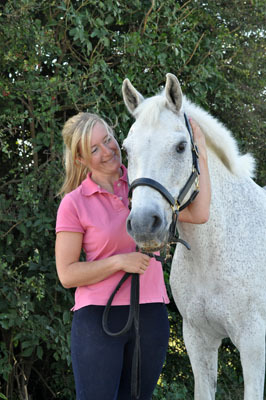 Chewy is a 26-year-old, 14.hh Connemara cross, who had his first bout of laminitis when he was nine. 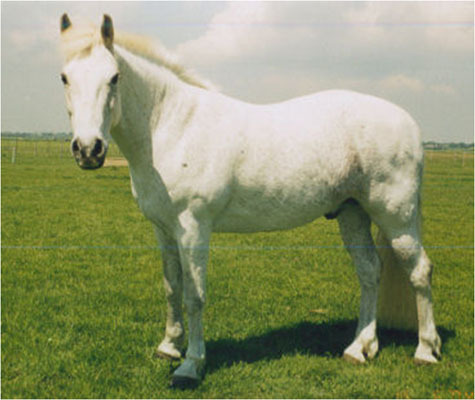 He suffered recurrent bouts through 2010 and 2011, which lead to testing and diagnosing of Equine Metabolic Syndrome (EMS) and PPID (Cushing’s). His owner, Rebecca, spoke to a member of the Dengie nutrition team, who weighed Chewy using a portable weighbridge – Chewy weighed 468kg and he was very overweight. His long road to recovery initially involved no turnout, restricted soaked hay and a diet of Dengie Hi-Fi Lite and Leisure Vits & Mins. 1kg of Hi-Fi Lite and 60g of Leisure Vits & Mins, split between his breakfast, lunch and dinner. Five hours of turnout from 7:30am to 12:30pm, wearing a grazing muzzle during the spring and/or autumn abundance of grass. In June 2014 Chewy’s weight crept up. Upon investigation, it turned out that Chewy’s hay wasn’t being weighed and his portions had crept up. When this was rectified, Chewy’s weight was soon under control again – this shows the vital importance of accurately weighing forage and feed. Since Chewy started his diet in 2011, he has lost an amazing 68kg. At his last weigh-in in September 2014, he was a much healthier 412kg. Hi-Fi Lite is the perfect low-calorie, high-fibre maintenance feed – ideal for overweight horses and ponies! We would like to add that Chewy’s weight continues to be monitored and the amount of hay and gazing he receives is always adjusted accordingly. 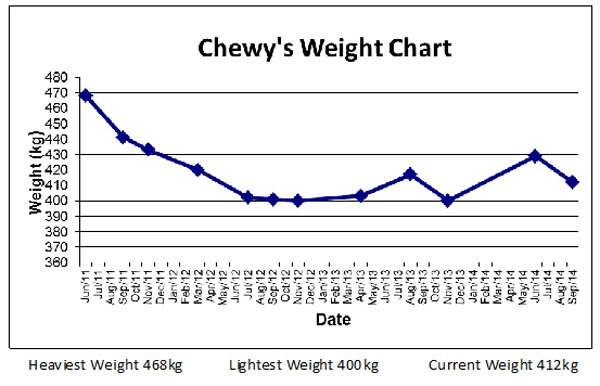 Chewy was initially stabled and fed 1.5% of his bodyweight dry matter until he lost the weight that he needed to. Now Chewy is turned out with a grazing muzzle whenever grazing conditions dictate this is necessary, basically when the grass is very abundant in the spring and autumn. His paddock is rotated in a pattern which means other horses graze his paddock before he does. Chewy typically gets turnout from 7:30 to 12:30 and 4kg of hay, but please note this does vary.If you are in the same position with your horse, it is important that you continually monitor their weight and adjust quantities all of the time.